Hindu Calendar : A Vedic Calender for your cellphone. Traditional wisdom in Telecom industry is that Indian customer only pay for only four type of content and services Astrology ,Bollywood,Cricket & Devotion.Collectively referred as ABCD of Indian mobile VAS.Most of the time when we speak of ABCD in general and Astrology specifically we think of it as an subscription services like Daily Horoscope alert on SMS. But relationship between Astrology and Mobile goes much deeper than that . 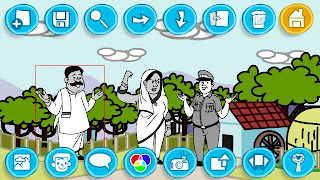 A little known fact about Mobile apps in India is that one of the first application which got significant traction in India was an astrology app for panchang and horoscope matching. it was way before the smart phone era .Long back in Late 80s and early 90s an application by Name of "Leo Palm" from Future Point was a de-facto tool for any Astrologer worth its name . 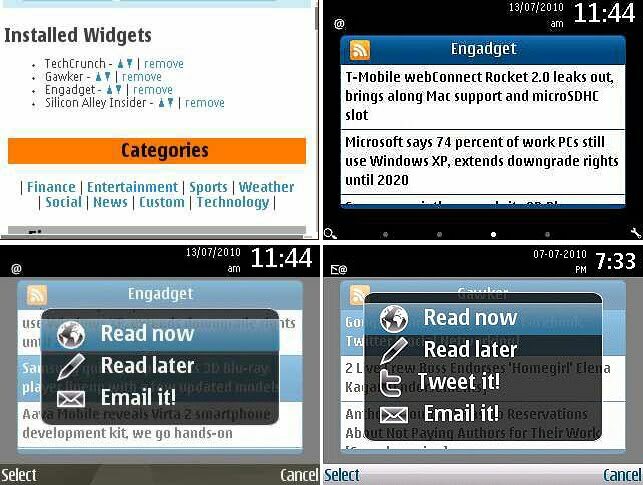 It was initially developed for Palm devices and later on available for Windows Mobile devices too. Many practitioner of Panchang and Vedic astrology (and i know some of them )still swear by it. However in the current wave of mobile apps there I didn't come across many decent application on Vedic Astrology and panchang. So I was understandably excited when I discovered an Panchang App for 2010 in Ovi Store. 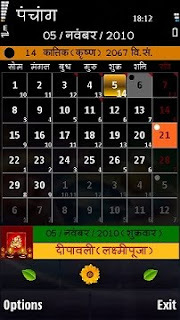 Developed by Adarsh Apps, Hindu Calender 2010 is your handy reckoner for Indian vedic calender. Just for € 1.00 you can download it from Ovi store (link),a free trial version can also be downloaded from their website (link). At 2.08 MB of file size it was hard for me to download it on GPRS so I installed the trial version on my Nokia N97 by side loading it from my PC. Installation was a smooth process of couple of steps.where you are asked to specify location and language preference. This app has got a rich UI with high information density.All the menu options can either be in between Hindi and English. Home screen is a regular calender view for vedic calendar. It maps Gregorian dates to corresponding Hindu dates. you can expand a particular date by expanding it by taping on block. Expanded view provides many information for each day like Sunrise and sunset,Moonrise,Paksha,Tithi,Nakshtra,Yoga,Sun Sign,Moon Sign etc . 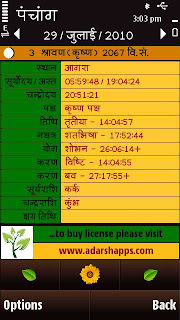 It also provides list of Hindu festivals including major events like Ekadashi, Shraddha, Eclipses, etc. All timings in extended view are local to current location specified at the time of installation .The Daylight Saving Time (DST) is adjusted for all locations supported by App.You can also see festival view of month and week.In this view all the Hindu festival occurring in that particular week / month are listed.Panchang provided by Adarsh apps works for more than 125 cities which include cities from other countries.This makes it an excellent value proposition for Indian diaspora around the world.I wasn't able to figure out a way to set an alert/alarm on panchang.This can be a good value add for the users. Their website offers an extensive FAQ section covering various aspect of using the app.which shows a deep domain knowledge and focus on the part of developer .Like Mr.Expense,this too seems to be an app developed by someone who has been in the domain for sometime . On a slightly patriotic note I would like to say that sometime back an industry colleague made an remark that most of the apps in world are made by Indians but very few of them are made (exclusively ) FOR Indians. 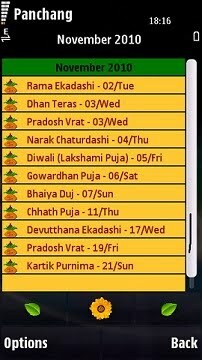 Hindu Calendar 2010 is one such app. Do give it a try. Lately I am noticing that thanks to some cool content apps my cellphone has replaced PC as my primary medium of content consumption online. But this shift of medium also comes with a subtle but important shift in my content consumption habit . Earlier I used to devote a fix time ( 2 hours post dinner ) to catch up on my reading list in feed reader. Its not that I didn't have time during the day or something but in most cases window of free time available was very short, not enough to fire up a browser , load the feed ,read a post and all. Doing same on mobile phone is slightly more difficult . So I always wanted to have a cellphone based feed reader of sort where first I can read snippets of my RSS feeds and if I like the preview,go to the full text . My fave metaphors to explain this usage behavior is of content snacking . On mobile phone, user love to snack on content in his/her free time and very rarely he/she choose to have a full fledged four course meal( ie read the complete post and accompanying discussion) . But most of the mobile RSS application were merely a port /optimization of desktop web experience on cellphone without taking any advantage of cellphones capabilities. Flyscreen is different.Its a RSS reader application with an interesting twist .It enables you to have zero click access to your news feeds by idle/sleep screen utilization. what it means in plain English is that it keep syncing the content in background and displays the snippet of your RSS feed content when your cellphone is in idle mode . so you can have a look at latest update from your face feed just by glancing at the screen. This is a very elegant use of most prominent and most underutilized onscreen real estate of your mobile phone. Developed by celllogic , Flyscreen is a free app supported for majority of Nokia devices .It can be downloaded from Ovi store (link) or side loaded using a PC from celllogic website (link) you can get it directly on your cell by pointing your mobile browser to: http://myf.ly/m . 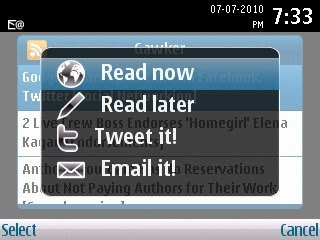 I downloaded it on my Nokia E63 and N95 . Installation file was of 225 KB in size and it took me couple of minute to download them over a GPRS channel. Installation work flow was glitch free and intuitive .you need to go through a registration process after installing the app . which is followed by configuration of the feeds of your choice .Here you can choose the pre-selected sources or add custom RSS feeds that you set on your own.There are 8 categories of content to choose from . You can set up a maximum of 10 different Feeds.You can integrate your Twitter account, and Google Reader with the app. Flyscreen allow you to define the frequency of sync(i.e. : how often application should fetch new content . once the configuration is done , flyscreen stay in background and display feeds on sleep screen of your device . its like having a full screen news ticker on your cellphone. If you like a specific news snippet you can expand it , see the complete story in browser and share it with your friends vial email ,facebook ,Twitter etc. What I like about Flyscreen is its excellent user interface and sleek intuitive work flow. Much of the technical complexity of fetching and optimizing the content for mobile screen is hidden from user and best part is that this usability hasn't been achieved at the cost of speed . I found Flyscreen to be faster than most of the other app in its category. This is by far the best use of sleep screen I came across. so if you think that you are hard pressed for time to catch up on your reading list and (like me ) you want to squeeze some hassle free reading in to your lunch hours than Flyscreen is just the right app for you. do give it a try I am sure it will help you to be on top of all the news. In my previous life I used to sell software , that job involved a lot of traveling to clients offices all over the country .Thanks to that job I ended up visiting a lot of cities in India.While I liked the traveling and meeting new people part of it . Keeping track of expense was a pain . I hated keeping track of expenses,stuffing receipts into pocket, purse,planner diaries and other places,scribbling un documented expense in spiral pocketbook and then sitting through the drill of reporting all that to folks in accounts dept back home and convincing them to reimburse them before I go broke ( I never liked them in fact as far as I know ,Nobody likes them). Being a Mobile enthusiast that I am ,I often thought of an app where I can maintain a list of expense occurred and export it to excel( our ERP demanded submission in excel). 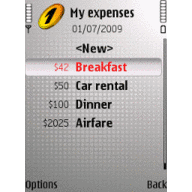 Mr.Expense is nearest to my idea of a simple and functional expense tracker for your mobile phone. Developed by sonipat( Yes! you read it right, sonipat) based Sinew Software Systems , Mr.Expense is a nifty app of just 110KB. 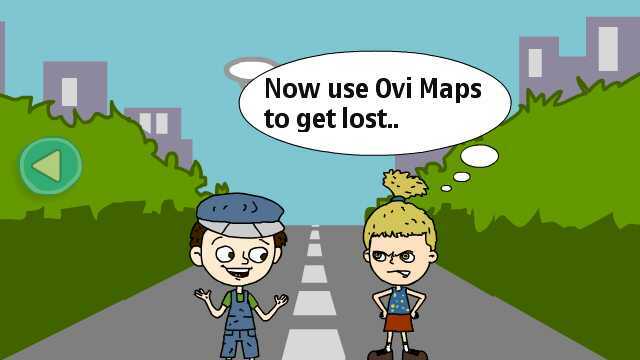 Its supported for Nokia Series 60 3rd & 5th edition devices.Its a paid app You can download a paid version from OVI store (link) for 2 euro. A 7 day free trial version is available at SINEW website . You can download it here. 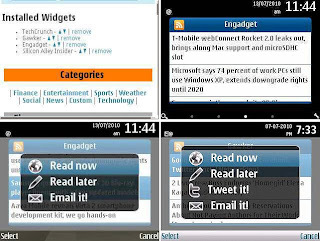 I installed trial version on my Nokia E63 . After a quick 2 step installation process and I was ready to use the app . 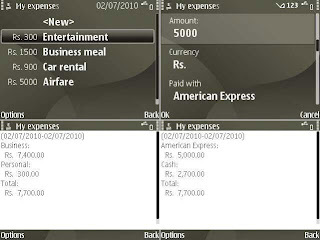 Mr.Expense offers wide set of functionality arranged in a surprisingly minimalistic user interface. It offers classification of common types of expenses like breakfast ,Biz dinner, Car Rental ,Flight ,Hotel Rent,Entertainment etc. you can also add your own expense type into the list. for every expense entry you have choice to enter your mode of payment like cash, check, Visa, Master card, American Express and such.you can also record your expenses in different currencies. 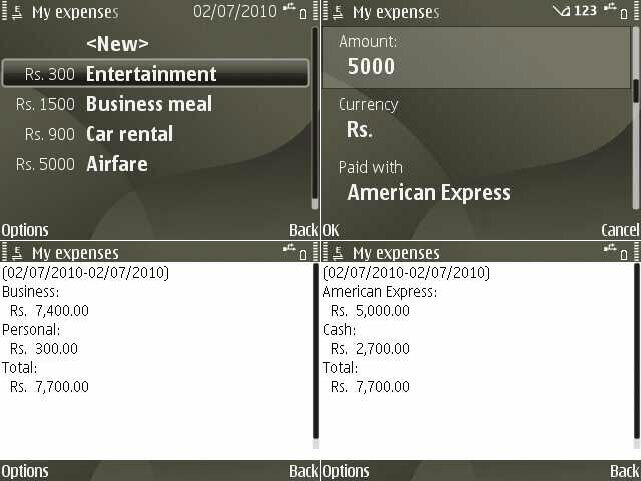 Mr.Expense offered you a good set of functionalities in creating reports on top of your expense data. you can segregate your business expenses from your personal expenses . export this information as Comma separated values (CSV) so that you can open them in excel. What I like most about this app is its simplicity . This gives a feel that designer of the app has been out in field and used "Other" method of expense tracking and like me and He/She too ,was frustrated by them . Some subtle features like multiple accounts , classification of expense as personal and business , having a separate entry for business lunch , report,support for CSV export shows a clear and precise domain understanding by app developer. As someone rightly said "Most good products in technology business are created by the guys who are trying to solve their own problem and addressing their own pain point" . Mr.Expense seems to be an example of that . Do give it a shot and share your finding with us.